Leather Dog Muzzles There are 27 products. 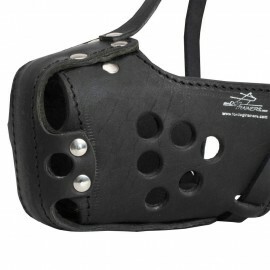 Super soft and comfy Labrador muzzle of genuine leather with Nappa lining. Perfect ventilation. Light weight. Adjustable. Nose area is padded with felt. No rubbing and discomfort. 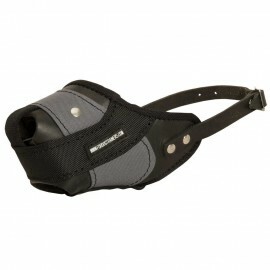 Safe and convenient Labrador walking with functional and safe leather mesh muzzle! 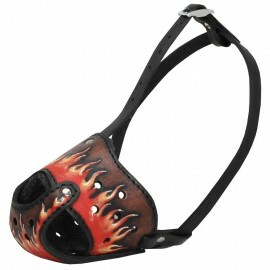 Unique leather dog muzzle hand painted with flames for Labrador. Special non-toxic and resistant to water paints. Thick leather is stitched and riveted. Felt padding gives additional comfort and prevents nose rubbing. Good airflow. 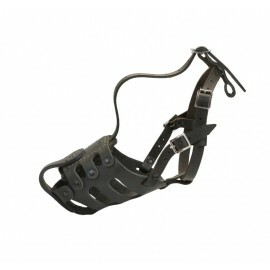 The muzzle is fixed with adjustable leather straps and buckles. Accidental taking off is excluded. Leather dog muzzle of original design for Labrador. Hand painted. Quality genuine leather. Stitching and riveting. Eco-friendly water-resistant paints. Large holes for good air circulation and free breathing. Felt padded for maximum comfort. No rubbing. Fit the muzzle size and fix it securely with leather straps. Lay emphasis on your Lab! 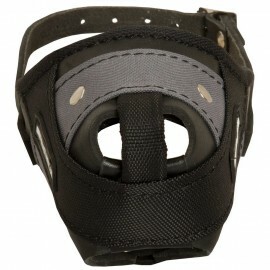 Labrador muzzle for training and service work. Thick and durable genuine leather. Stitched, riveted, equipped with metal plate in the front part. Felt-lined nose area. Perfect air circulation. Leather straps are adjustable. Enough free space for mouth opening and panting. Prevents from eating from the ground.